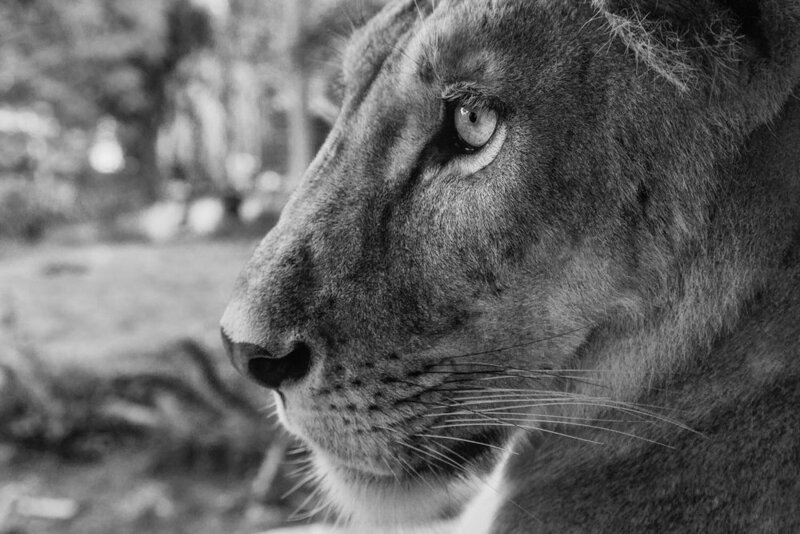 A close up, highly detailed study of a lion, in profile, at the Bali Zoo near Ubud in Bali, Indonesia. Photographing wildlife is exciting and technically challenging. In fact any kind of animal photography presents challenges for the enthusiastic photographer. But how do you go about creating wild animal images that speak to your connection with what you photograph? You can scan the internet for images made by famous wildlife photographers. 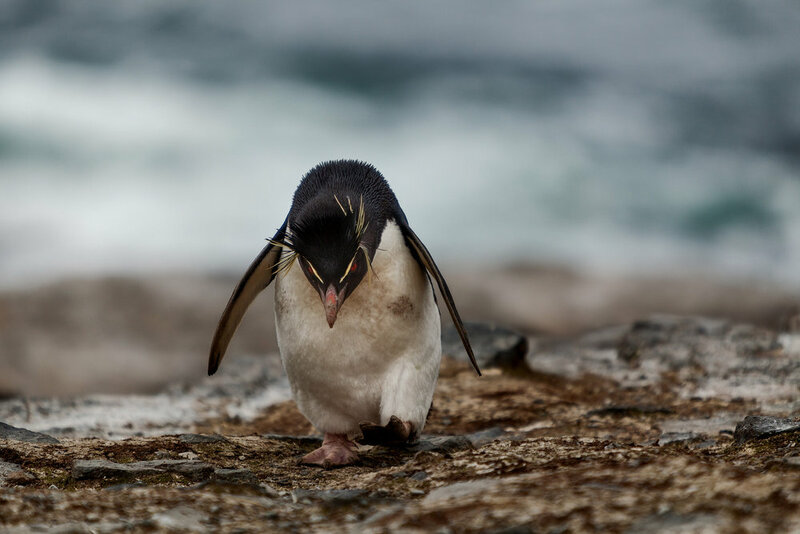 What you’ll likely find is that the most memorable photos showcase an understanding of animal biology, psychology and respect for the animals photographed. Out of this deep understanding a unique viewpoint is, overtime, developed. The photos of Nick Brandt come to mind. His work is emotive, empathetic and totally authentic. A King penguin standing in front of a church at Grytviken, the site of a former Norwegian Whaling Station, on South Georgia Island. While it’s fun to research how to become a wildlife photographer, what’s going to set you aside from the competition is your unique approach to photographing wildlife. You could call that your signature style. But style is not something you get for $9:97 when you buy some other photographers Lightroom presets. By all means incorporate presets into your workflow, if it helps. But to realize your full potential, as a creative being, you need to find your own way. Making images that look like someone else’s is fine, as a starting point. But that should never be the destination you aim for. You have to realize your own potential, and overcoming the need to copy someone else’s look is an important stage in the creative process. Living the artists life is about continually finding points of departure. Robert Capa was a Hungarian-born, American war photographer. Capa was famous for how close he managed to get to his subjects when making photos. His colorful life and photo legacy have ensured the above quote has become one of the most famous and influential in the world of photography. In most cases I think he’s right. Moving close and engaging with your subject is often the best way to make an engaging and compelling study, be it human, animal or still life. You could certainly make an image by employing a big telephoto lens, from a distance. But that approach, while it might help create a candid feel, will rarely achieve the same sense of intimacy you achieve by working up close, in an interactive manner, with your subject. There's a thin line separating the ideal distance at which you should stand from your subject. Push too close and you risk intimidating them. Move too far back and you lose control. But don't let your own lack of confidence fool you. It could be argued that the minimum distance from where you should make your picture is determined by the subject, not by you. By overcoming your own shyness you'll be able to move closer, both physically and emotionally. The subject’s eyes will often appear more prominent and, as a result, the character or mood of the subject will be better understood by your audience. Your courage will be rewarded through the production of dynamic and emotionally compelling portraits. 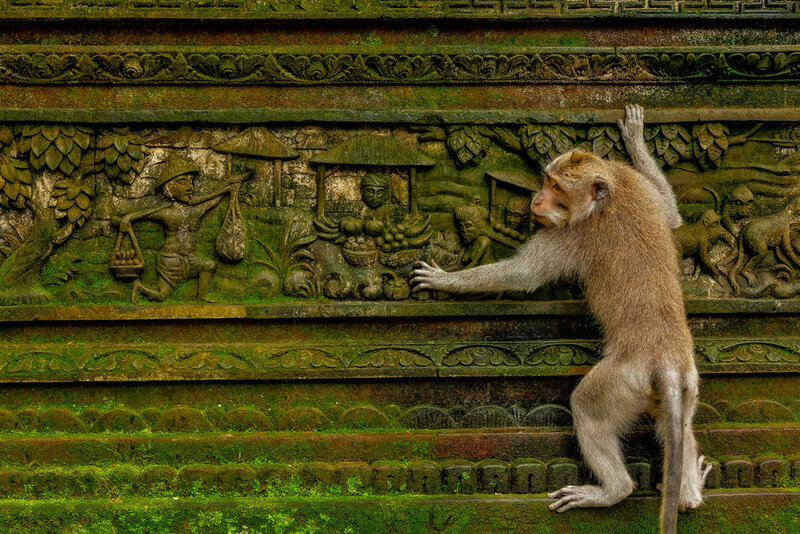 A monkey climbs up a carved wall, featuring scenes of traditional village life, in the Monkey Forest in Ubud, Bali. Now, just so I don't misrepresent myself or my abilities, the image at the top of this post was made at the Bali Zoo in Bali, Indonesia. While most folks visit Bali for the sun, surf and nightlife I’m much more interested in the nature, history and culture. That’s why I have no problem recommending the Bali Zoo as one of the best places to go in Bali. The Bali Zoo is close to the cultural centre of Ubud and can easily be incorporated into a Bali day tour. While I’ve made wildlife photos in isolated and very challenging environments, I’m no wildlife photographer. That is to say wildlife photography, while exciting, is not a speciality of mine. I’m a travel photographer and the images I make include people, landscape, architecture and wildlife. But people and landscape photography are my areas of expertise. As far as the image of the lion at the Bali Zoo is concerned, the photo was made with me safely positioned behind protective glass. Nevertheless, it was a pretty special experience being that close to an adult lion. I felt enormously privileged by the opportunity and did my best to create a beautiful study of the lion. So how far away should you stand when photographing people or wildlife? While there are certainly technical and aesthetic considerations, I think it’s reasonable to take Robert Capa's quote as good advice for the average photographic situation. But, of course, there's always at least one exception to any rule. Age, gender, culture, religion and personal safety may temper your approach. And that’s true for both you and your subject. Of course wildlife photography and war photography requires a very special skill set and a particularly keen awareness as to the degree of safety in which you find yourself. My advice is to stay alert and to be safe. Taking significant risks is best left to the professionals. A close up studyof an elephant, in profile, in rural Thailand. A sobering thought comes from the knowledge that Robert Capa made his famous quote not long before he stood on a landmine in Indochina. Capa died following that encounter, but his legend and photography, including joining Company E as part of the first wave of landings on D-Day lives on. A darkroom disaster ruined all but ten frames of film from that momentous day for Capa. Some of them have been revisited in the Steven Speidberg film Saving Private Ryan staring Tom Hanks. There's a definite line of demarcation that separates the courageous photographer from the rest of the pack. Each of us has to decide what side of the line we're going to operate from and, by doing so, take responsibility for the way we interact with the subjects in our photos. Following the path you lay out for yourself will determine the story you get to tell and, importantly, how you tell that story through the photographs you create. Photographing Wildlife At The Zoo - What's Your View?